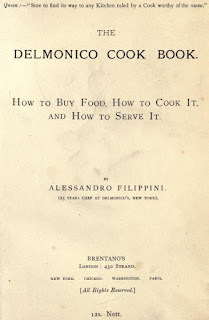 A hundred years ago to this day, on December 8, 1917, a remarkable restaurateur died in New York City - unnoticed by the public: Alessandro Filippini (or Alexander Filippini, in the anglicized form), one of the most influential chefs in the famous Delmonico's restaurants. Like the Delmonico brothers themselves, he was an emigrant from the Ticino in Switzerland who settled in the New World in the second half of the 19th Century and left his footprints there. and served under the regiment of Charles Ranhofer, the French chef who was in charge of the Delmonico kitchens since 1862. At Delmonico’s for only two months, the young cook already learned what it meant to be in the kitchen of the city’s most famous restaurant: President Andrew Johnson was visiting New York, and of course it was at Delmonico’s that the citizens of the city hosted the dinner in his honor on August 29, 1866. It was „the finest dinner with which I ever had anything to do”, Filippini much later told a journalist. 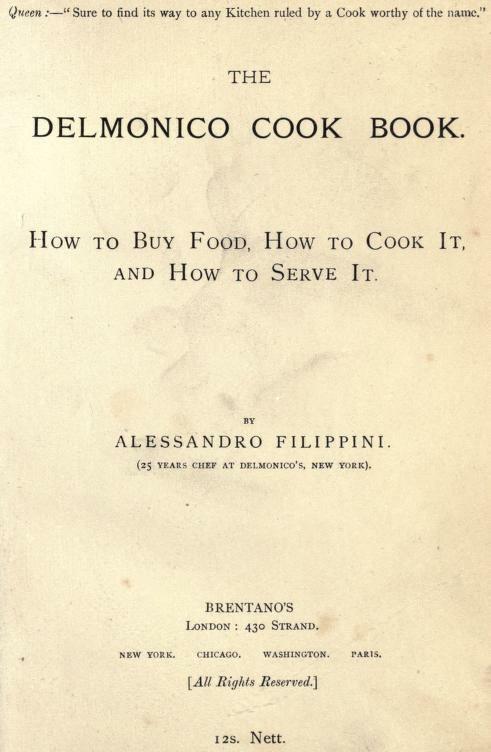 In 1885, just after the death of the great Charles Delmonico (who was succeeded by Charles C. Delmonico), Filippini began collecting and writing down the recipes used in the Delmonico kitchens, and after five year’s work he published it in book form as “The Table”, or “The Delmonico Cook Book” (1889). Not only did Filippini give a bill of fare for the three meals of each day of the year, with the corresponding recipes, but also extensive advice about the seasonality of all kinds of foods and about how to set a table and how to serve the food. From the restaurant at 14th Street, Filippini went on to their Broad Street Restaurant (until 1883), then to their Pine Street Restaurant, and when that closed in 1889 he moved to the new Delmonico’s restaurant at 341 Broadway. He soon became one of the pillars of the Delmonico empire. As a journalist of the New York Tribune noted in 1891, Filippini "has been at one and at all times the manager, the buyer and the inventor of toothsome dishes. Every morning for twenty-five years he arose in time to visit the markets by 3 o’clock, where he purchased the daily supplies for all of the Delmonico restaurants, uptown and downtown. No man ever knew better than he the value of food products, and none could buy so well for his employer. Every day he visited the various restaurants, studied their needs, made suggestions and improvements in the service, and kept everything running with perfect smoothness. Not an hour of the day was he ever idle, and his black hair has become silver-streaked in his long service." When in 1890 Charles Delmonico decided to close the restaurant at 341 Broadway, Filippini regarded this as an opportunity and opened a restaurant of his own – Filippini’s – just a block away, at 337 Broadway. Filippini told the press that he “intended to keep only the best food, wines and other beverages”. The New York Tribune, in view of the opening of Filippini’s, anticipated that “the restaurant, which will be run on the same plan as Delmonico’s, is destined to have many patrons.”Alas, it did not, and in May 1893, Filippini had to close Filippini’s Restaurant and make an assignment of his property for the benefit of creditors. During the short life of his restaurant, the chef and owner however found time to put out three more cookbooks: “One Hundred Ways of Cooking Eggs” (1892), “One Hundred Ways of Cooking Fish” (1892) and “One Hundred Desserts” (1893). He may actually have been out of work for some years until around 1898 when he entered into the services of the International Navigation Company (later renamed International Mercantile Marine). His new employer was the large conglomerate, backed financially by the banker J. P. Morgan, that owned and operated at one point 188 ships, including the American Line, the Red Star Line, the White Star Line and half of Holland America. He became the “travelling inspector of the American liners”, called in to systematize steamship cooking on a new basis. He reportedly got on board a ship without previous arrangement, not being expected, and watched the preparation and serving of meals, showed the cooks and bakers essential details, and also made sure that the table stewards were in good training. Moreover, he also oversaw the composition of the menus served on board, evidently his core competence. Armed with a letter of introduction to United States consuls in all parts of the world, obtained from Secretary Hay at the instance of Senator Chauncey Depew, in 1902 Filippini went on a trip around the world, starting in Honolulu in January and ending in Paris in September of that year. He travelled through Japan, China and Hong Kong, the Philippines, Singapore, India, Egypt, Greece, Turkey, Romania, Hungary, Austria, Germany, Belgium and his old country, Switzerland. By visiting innumerable hotels, restaurants and private homes, he gathered over 3,300 recipes that he arranged to form suggestions (as in “The Table”) for “complete menus of the three meals for every day in the year” and published them as “The International Cook Book” (1906). Very little is known about his private life. Filippini lived most his life in New York City, for the better part with two sisters and a brother, who also emigrated from Switzerland. The busy life at Delmonico’s and then the long periods on board of the ships seem to have prevented him from marrying, but quite late in life he met Julia Martinoli, a Swiss widow seventeen years the younger, who became his companion, and in 1898 their daughter, Alice Filippini, was born. 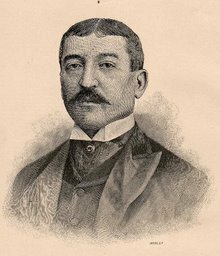 Alessandro Filippini died on December 8, 1917 in New York City, at age 67. Neither a report nor an obituary was published in any of the newspapers. Adamant New York had already forgotten about him. Kulinariker und Opernhörer - beides nur als leidenschaftlicher Amateur.